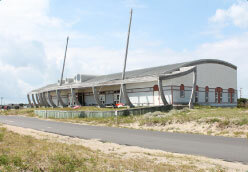 The Graveyard of the Atlantic Museum is a great stop for some of Hatteras Island's rich and storied history. Hatteras Village is located at the southernmost part of Hatteras Island and is the final beach along the Cape Hatteras National Seashore. This great seaside village offers exceptional fishing, 4x4 beach driving, and the ferry docks that provide transit to the ever-popular Ocracoke Island. While this village is the southernmost area along the drivable Outer Banks, it should not be confused with Cape Hatteras, which is the spit of land jutting out into the Atlantic Ocean at Buxton Village. Known primarily for its hand in the fishing industry, Hatteras Village thrives both commercially and recreationally when it comes to inshore and offshore fishing. Due in part to its easy access to the Gulf Stream, locals and visitors alike are sure to be pleased with the days catch. Similarly, this translates to local restaurants within the village that offer only the freshest ingredients caught off the shores of the OBX. Shopping within Hatteras Village has developed over time and now features various shops from art galleries and clothing boutiques to seaside trinket stores. While exploring the area, make sure to delve into the Graveyard of the Atlantic Museum to learn about the treacherous waters, countless shipwrecks and wartime history of the Outer Banks. Sun Realty is proud to represent vacation homes in Hatteras Village and the properties offered by Sun Realty range in size from two-bedroom condos and small vacation rentals to luxury, seven-bedroom havens within this area.